As I have outlined several times recently, the technical picture for silver and gold is very different at present. Whilst in the past the two commodities have found a close and positive correlation, this now appears to be breaking down and it is no longer a simple case of assuming that where gold prices go, then spot silver will follow, which was once again demonstrated yesterday. 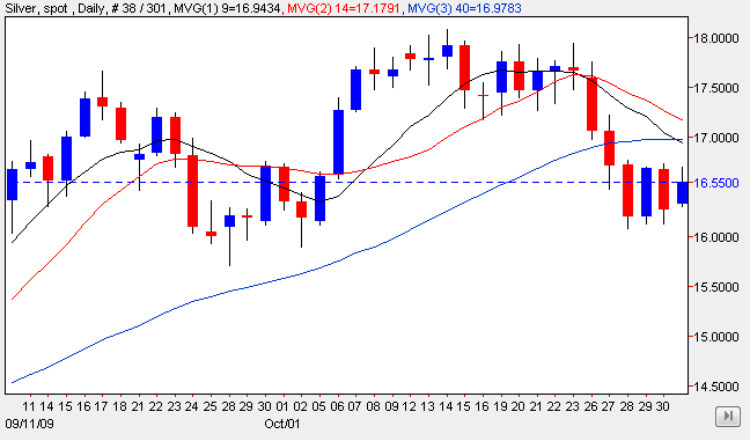 Whilst both metals ended the day higher, spot gold ended with a wide spread up bar which almost broke out into new high ground once again and well above all three moving averages, spot silver ended with a narrow spread up candle closing below all three moving averages. In addition the price of silver is now trying to battle its way higher through an area of deep congestion, and facing stiff resistance above in the $18 per ounce level – a very different technical picture to that of gold. As such we therefore need to be careful in any analysis, with gold looking very bullish, and spot silver prices most certainly bearish. Given this current dichotomy, it is hard to draw any firm conclusions given the long and well established correlation between the two commodities, but looking at the silver chart in isolation for a moment, the moving averages are certainly adding a degree of downwards pressure, and until we see a break and hold above the $18 per ounce level, then the bearish sentiment is likely to remain in place. The encouraging signal for silver bulls is the floor at $16.25 per ounce, which may well provide the necessary platform for a move higher in due course, however should this ultimately fail, then we may see a re-test of support in the $15.25 price level in the medium term. This, of course, all assumes that the ‘disconnect’ between gold and silver continues, and given the very different technical pictures at present, this seems likely in the short term at least.